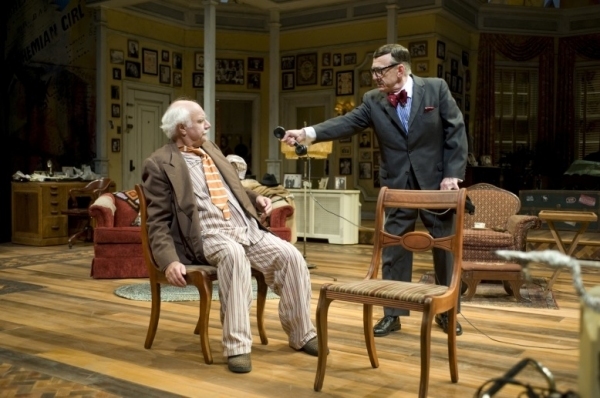 I've been looking forward to seeing The Sunshine Boys at the Guthrie since I heard it would star Peter Michael Goetz and Raye Birk, two of my (and I think everyone's) favorite Guthrie actors. 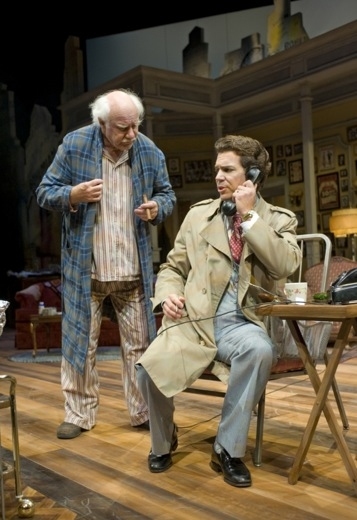 Both of them have been in countless Guthrie productions since the 1960s, as well as many movies and TV shows. These two experienced actors are excellent at both comedy and drama (Peter recently starred in Long Day's Journey Into Night in DC and will reprise his role at the Guthrie early next year, Raye will tackle King Lear at Park Square Theatre this fall). This play gives them a chance to show off their comedy chops, and they do. 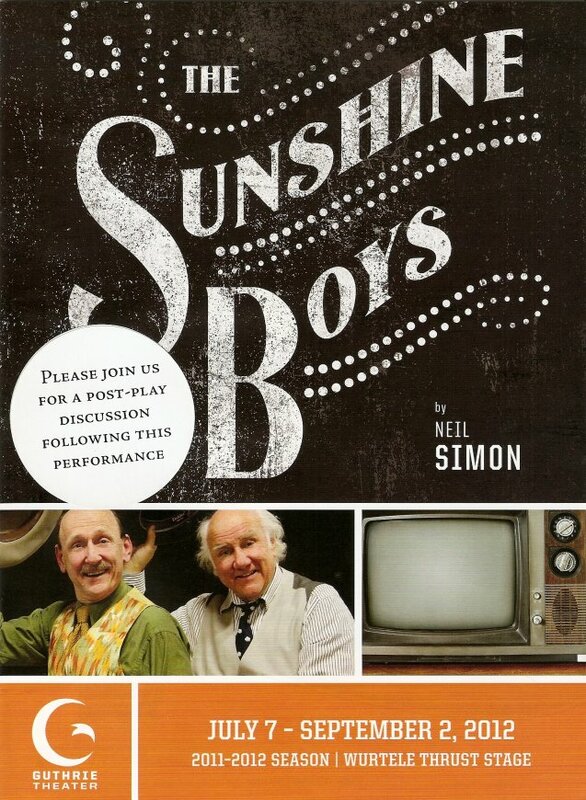 Written by Neil Simon, The Sunshine Boys is about a pair of old Vaudeville performers who have had a falling out, but come back together in 1972 to perform on a TV show about the history of comedy. As you can imagine, it does not go smoothly, much to the delight of everyone watching. Peter Michael Goetz is Willie Clark, who lives in a once glamorous but now run-down hotel in New York City. He's still working as an actor, doing the occasional commercial, but jobs are becoming fewer and farther between. He refuses to retire, and chides his agent nephew Ben (played by the wonderful Robert Berdahl, who serves as the straight man grounding these two crazies, dressed in a series of fabulous 70s era suits) about finding him a gig. It turns out Ben has found a gig for Willie, but it involves reuniting with his old partner Al Lewis (Lewis and Clark, get it?). Lewis unexpectedly retired 11 years ago, and the pair hasn't seen or talked to each other since. Willie reluctantly agrees to a rehearsal with Al to see how things go, chaperoned initially by Ben. It falls apart, but somehow they advance to an in-studio dress rehearsal. Act Two begins with the busy TV studio and we get to see the infamous "doctor sketch," in which Dudley Riggs (himself a real-life veteran of the Vaudeville stage and founder of the Brave New Workshop improv comedy troupe) appears. Until that, too, falls apart. The play ends with these two lifelong friends reminiscing about old times and facing the rest of their lives together. It's a true love-hate relationship, beautifully portrayed by Peter and Raye. The banter, the awkward silences, the way they play off of each other, the distinct way they walk around the stage, the broad New York accents, Willie's schlubby style in contrast to Al's fastidiousness, all of it is so precise and so much fun to watch. As you can see from the sticker on the playbill above, I happened to attend on a night when they were holding a post-show discussion, an opportunity I never pass up (and you shouldn't either, if you're at all interested in listening to artists talk about their work). It was really fascinating to hear about all the work that goes into this seemingly effortless performance, and it made me want to watch it again. Peter said that rehearsing a comedy is torture, because there's no audience there to laugh so they don't know if they're funny or not. It's not until the previews that they figure out what works and what doesn't, and they have to adjust a little to allow for laughter. The opening was just last Friday, so he said they're still settling into it. Jennifer Maren (who plays the requisite blond bombshell in the sketch) talked about how a comedy like this is similar to a musical in that it has a certain rhythm and cadence. It's intricately choreographed, such as the scene in which Lewis and Clark spend several minutes moving furniture around to set up for their rehearsal and don't say a word. I'm pretty sure I could listen to Peter Michael Goetz tell stories about his life in the theater for hours and hours. His experience in the early days of the Guthrie, on Broadway, and in Hollywood I'm sure provide many amusing anecdotes, like the time he walked onstage during a performance of a classical Shakespeare play dressed as Lennie in Of Mice and Men, back in the days when the Guthrie was a repertory theater (which he says he misses). This is why I love the Guthrie, for bringing actors of this caliber to my town and keeping them here, even after they venture to the East and West coasts. The Guthrie may no longer be a repertory theater, but you can still see three excellent and very different shows at the Guthrie right now, each wonderful in its own way. Starting at the top, the lovely dance piece Swimming with My Mother is playing in the Guthrie Studio through this weekend. If you're looking for a good old-fashioned musical, go see Roman Holiday. 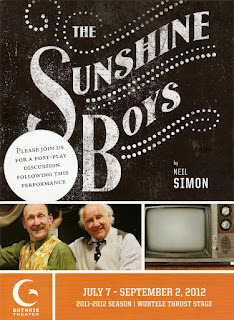 And for a hilarious and intricate comedy, there's The Sunshine Boys. Or go see all three - sounds like a perfect weekend to me!